There are many small kitchen ideas for organizing and improving your rented home – even during the hectic holiday season. For us at home, the kitchen is where the magic happens, from the sweet delightful desserts and pastries to the mouthwatering dishes. However, there might be a slight challenge if you have a small kitchen in your rented space. Not to worry, because these small kitchen storage ideas will certainly help out. Whether you need a knife strip or a spice rack, these beautiful small kitchen ideas and budget kitchen tips will make the crazy holiday season a breeze. Cabinet doors are an underutilized part of your kitchen. 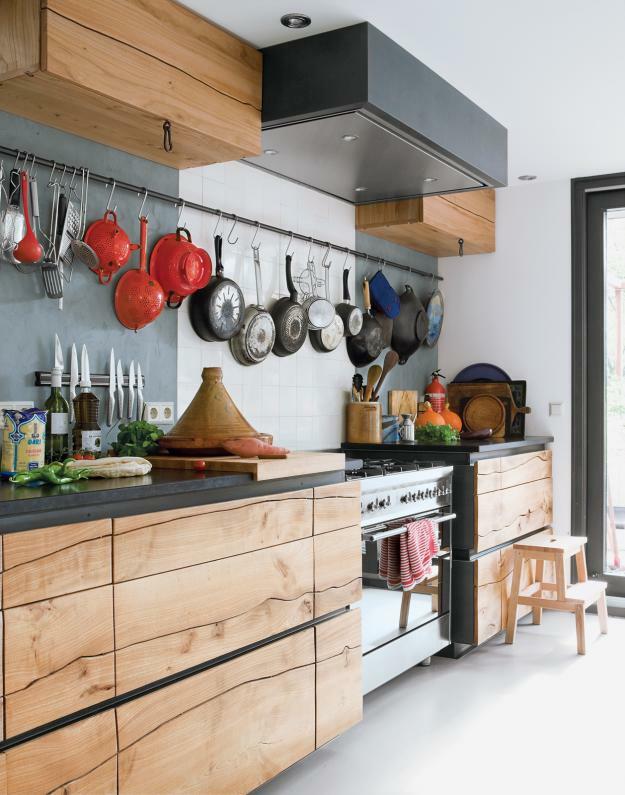 You can add hooks and small racks for utensils, spices, condiments–basically anything, really. Modified cabinet doors give easy access, convenient storage and best of all, no more clutter. It's the most common problem in having a small kitchen – narrow countertop space. To create more working space, you can use the top of your burners to create a makeshift countertop. You will have more space for preparing, chopping, and holding cooked food. Pegboards are not only found in your craft room, it can well be used in the kitchen too. Attach a pegboard to your kitchen wall – of course without damaging your wall – and add hooks so you can hang pots and other kitchen materials. This is one clever way to make use of vertical storage space. Here's how. The sides of refrigerators and cupboards are also an often-overlooked storage opportunity. A DIY magnetic rack will be of great help in managing your bottles of spices and condiments. Aside from proper storage, you also have them within arm's reach. No more frequent opening of cabinets or messily leaving them in the countertop. Just simply attach magnets at the back of your racks and mount them on the sides of your cabinet door or refrigerator. If you're trying to think of small kitchen ideas for organization, don't forget the trash bags. These essential kitchen items can be pesky to store–but now there's a solution. Click here to learn a step-by-step guide for trash bags on a roll. Wow! Check out the craftsmanship and class on that table! Did you know you can make one yourself? Essential #IkeaHacks are up on our site (link in bio). Happy crafting! Skip the usual knife rack that will sit atop your kitchen table or countertop and consume space. You can DIY your way to a magnetic knife rack. You now can arrange your knives in a cool way, have easier access, and have an added element to your decor. What a win! If your rented house cannot offer more space for storing your kitchen items, you may add a kitchen cart to hold them. The top of your cart can be used as an added space for food prep or serving, or a place where your most used items can be easily seen. Just place it strategically so it won't get in the way of your cooking. Check out this tutorial to learn how to make one. If you can't afford to have a produce rack sitting in the middle of your kitchen table or on the counter-top, then just hang it. Consider using the space on the sides of your kitchen cabinets. You can attach a rack that can hold produce. It's totally a space saver. Here's how you make one. Who would have thought that an old door could become one of the best small kitchen ideas? You can decorate the door any way you like, then hang all your kitchen's bits and bobs on it. The possibilities are endless. Tutorial over here. Sometimes we don't always care enough about how the insides of our cabinets are organized and utilized. 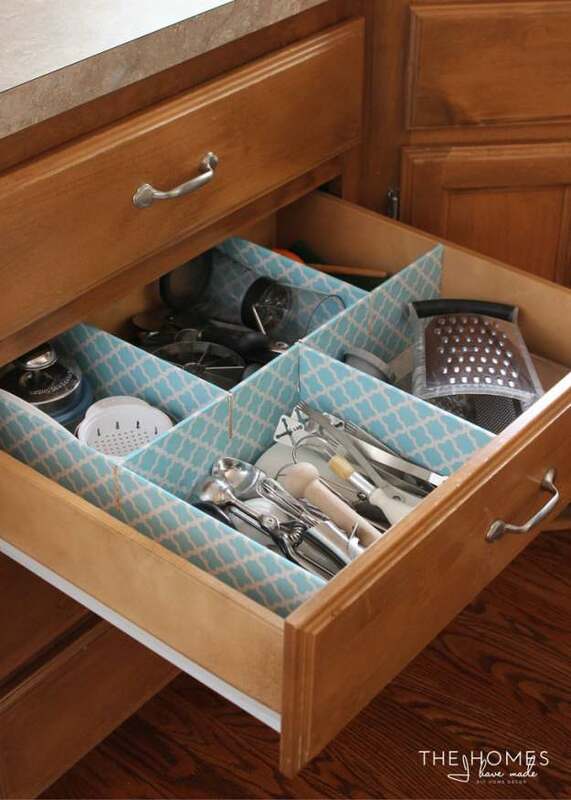 Baskets in your cabinets will accommodate all your kitchen supplies. You don't need to rummage just to get at the back portion of the cabinet to get an item – or worse, forego the back portion of cabinets because they aren't as accessible. Don't forget to label them! Washi tapes can work wonders at that. If one of your most frequent dishes to prepare is salad, it would be clever to put all your needs in one place. Put all the jars of the things you use most often in one place and store them neatly. You can also manage the space more efficiently with this salad bar. Check it out here. Hanging towel racks are a great way to save on space for your kitchen. They're easy to access, and they make use of your kitchen's vertical space. Check out how to make them for yourself here. While the tutorial was made for the bathroom, you can adapt the measurements to suit your small kitchen. If your cabinets are organized already and you don't need a basket in there, you can put the basket in the space above your cabinets instead to add more storage space. It would be great to store items that are not frequently used but are needed from time to time at the topmost portion. It's also easily visible. This is one of the most clever things I've seen; I can't help but recreate this in my own kitchen! It's really cool and an ultimate space saver. Your cabinets now are widely maximized, from the inside, the top, to the sides, and now at the bottom portion, too. Choose what you will store inside these hanging mason jars, like snacks or common cooking ingredients. Click here to see how it's made. It's not enough to have drawers and stuff utensils in. It takes organizing too. Compartments will be your best friend for this. A DIY compartment is highly customizable and can address your needs and design, especially if you store utensils that are varying in sizes and uses. Create yours for a more efficient storing. A long bar will accommodate most of your pots and pans, and if you place it stylishly you are not just addressing storage concerns but also interior design. You can also hang and group your utensils for cooking or even baking. There are so many possibilities, you just have to be strategic. Let's admit it, there are just some times that our drawers cannot hold all of our utensils, especially if they are in varying shapes and sizes. When this happens, you can play with your jars and turn them into utensil holders. Place them in your most convenient spot in the kitchen and this way, you have stored them creatively too. Your space may be rented, your kitchen may be small, but there's always something to do about it. There are items you can add, areas you can manage, and storage you can properly organize. Don't fret about the hectic holidays ahead, because there are always small kitchen ideas you can adapt. Do you have your own ideas too? Add them to the list or leave a comment below. Want more kitchen upgrades? Click here to see how you can build your own kitchen island storage!